This is one of my favourite childhood treats. On the weekends when I used to go grocery shopping with my parents at Asian supermarkets, my mum would be on a mission to get the week’s worth of groceries that she had planned and budgeted for, she’d be busy scouring bargains to stock up on and haggle with the shop owner for a free goodie once our shopping basket reached a certain amount. Most of the time it would just be a free bottle of oyster sauce but it gets added to practically everything we cook and we’d go through bottles fast. A free bottle of oyster sauce is worth fighting for…and Chinese mums will go to great lengths to save a bit of money here and there. I would be on my own mission down the sweet aisles eyeing off the shelves overflowing with infamous Pocky, Hello Kitty, Yan Yan and the like, to see what treat I could get my parents to buy for me. It’s hard to resist Asian sweets when they make everything so damn cute! But in the end I would always be drawn to the selection of sweets near the counter. These are generally prepared by people who work from home, and distribute their goods to Asian supermarkets, which sell on commission. It would be fresh, homemade and have my parent’s approval. My favourite was Vietnamese coconut cassava cake. This cake is unlike Western cakes which are light, fluffy and crumbly. In fact, it’s the complete opposite. It’s dense, sticky and chewy. 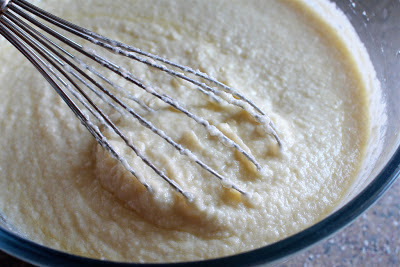 For people who aren’t used to this kind of texture for a cake, I imagine that it would be quite strange. A lot of Asian cakes are like this and it's not an accident. Back in the day, few households owned ovens so many cakes were made by steaming resulting in a spongy texture. Also, cassava is used, which is very starchy and the plant also produces tapioca starch (similar to corn flour/starch) – a thickening agent for sauce and soups etc., hence it’s glutinous. As people acquired ovens, they adapted and could bake cakes that would normally be steamed. So now you will find steamed and baked versions of cassava cake. I like baked cassava cake as it has a caramelized crispy golden top which is a standard for Western cakes. This is the best part of the cake but it’s still sticky on the inside, so you get the best of both worlds. I have been trying to recreate my childhood treat. 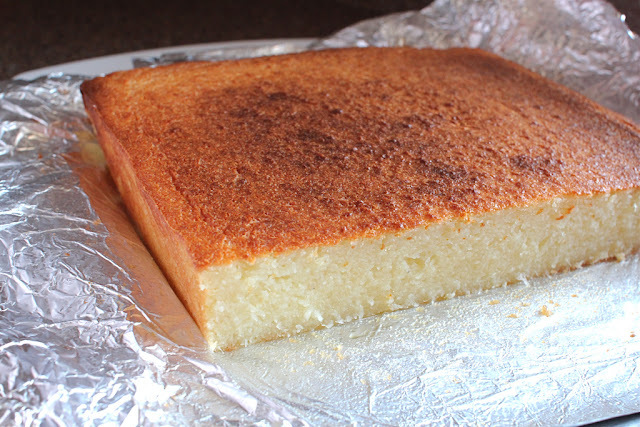 I looked up recipes on the internet and found that a cassava cake is a common dessert across South East Asia due to the tropical climate, cassava thrives in the region. 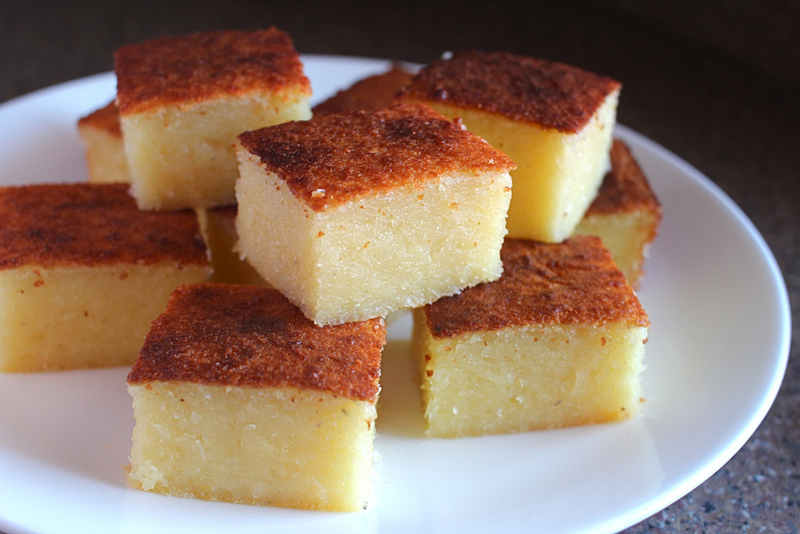 In Vietnam it’s known as bánh khoai mì nướng which literally means baked cassava cake and in Malaysia they call it kuih bingka with kuih referring to bite-sized snack/dessert foods commonly found in Malaysia. I’ve discovered that there are many ways to make a coconut cassava cake. 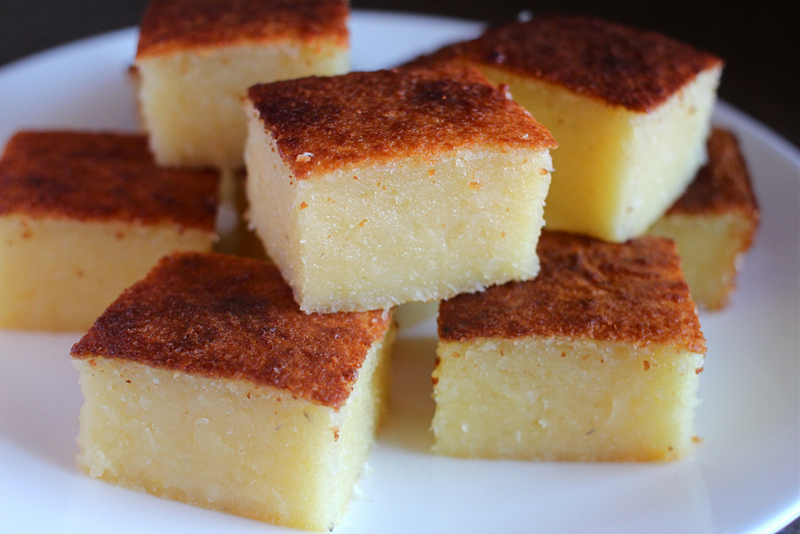 It can simply be made with just cassava, coconut milk and sugar, these are the building blocks of the cake. There are various recipes which add other ingredients such as dessicated coconut, condensed milk, yellow mung beans and eggs. Every recipe I came across was different, reflecting the fact that this is one of those homemade treats where every mum would have their own way of making it. 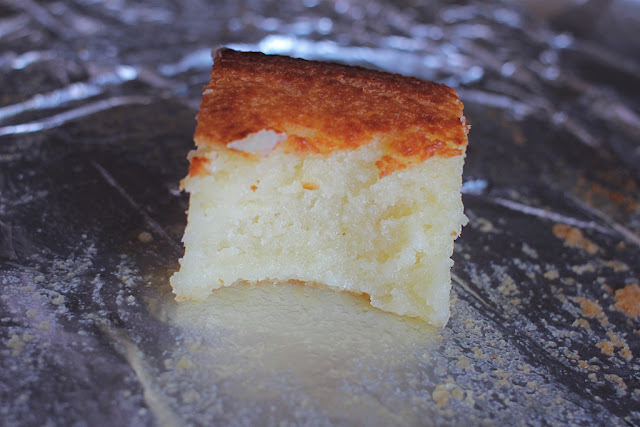 So after examining a few recipes, I started baking cassava cake with just a few ingredients and each time I made it, I would vary the ingredients and adapted my recipe until I got something that I felt was better than any other cassava cake I have ever eaten. It’s as sweet as I want it to be, coconutty and buttery with a hint of nuttiness due to the addition of yellow mung beans. This is also a gluten free cake. It's interesting to note that a lot of Asian cakes are gluten free due to rice flour, tapioca flour, yellow mung beans etc. being commonly used to make cakes as these plants are easily cultivated in their tropical climate, wheat does not grow as well. 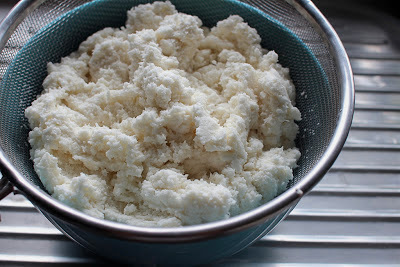 Note: Fresh cassava requires much preparation (you have to peel then soak to remove some of the bitterness, grate, soak again, settle the starch, combine starch with grated cassava etc.) so I opted to use frozen grated cassava that I bought from my Asian supermarket. Preheat oven to 180C. Line a 20cm square baking tin with foil and grease with melted butter. Thaw the frozen cassava. I left it in the fridge overnight and then put it in a strainer to drain away the extra liquid. 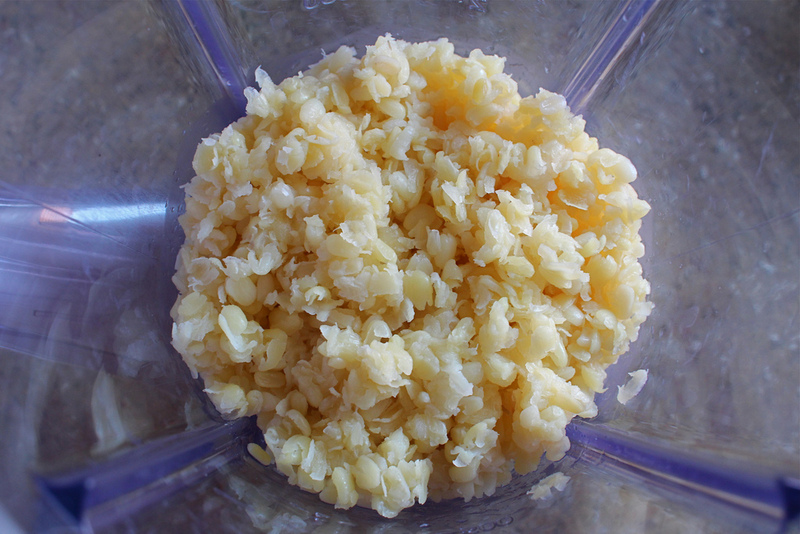 Prep yellow mung beans - In a bowl, wash yellow mung beans thoroughly and soak for at least 3-4 hours before cooking. Drain and place yellow mung beans in a saucepan, cover with water and bring to boil, then lower heat and cook mung beans for 15-20 minutes until the yellow mung beans are soft and tender. 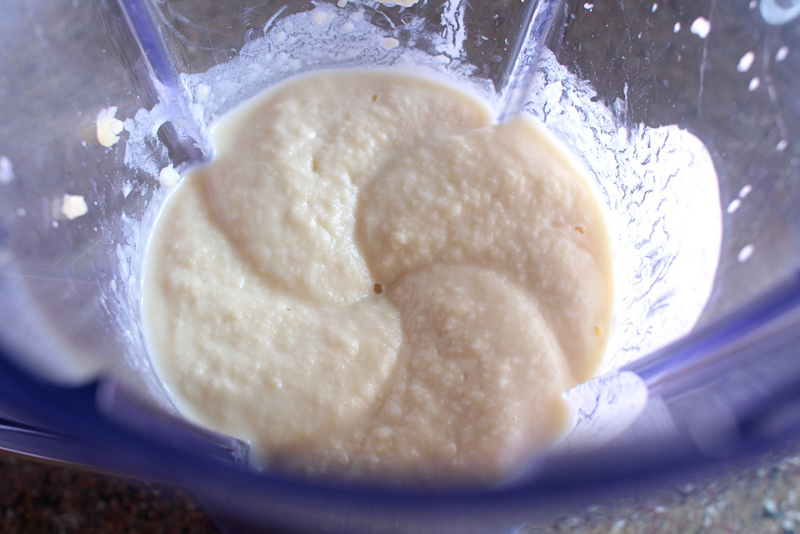 Drain well and then place the cooked yellow mung beans in a blender and pulse a few times, then add in ¼ cup of coconut milk and process to a fine puree. In a large bowl, whisk the caster sugar and eggs together, then add in vanilla extract, salt, melted butter, 1 cup of coconut milk, condensed milk, cassava, dessicated coconut and pureed yellow mung beans. Mix together well so that everything is fully incorporated. Pour the mixture into the baking tin and bake for 1 hour until the top is a crisp golden brown. Cool and then slice into pieces. I saw Peter Kuravita use cassava recently and wondered about it. This looks SO good :) thanks for joining the hop! Yum, Ai-ling! 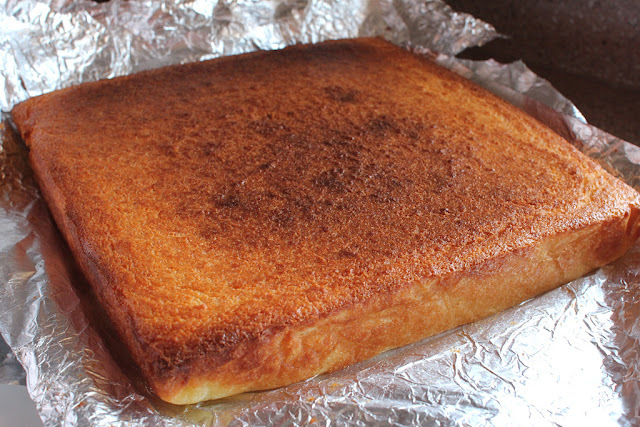 Never made Asian cakes before, though I really should try them, this'd be a great place to start. Thanks Heather :) Knowing you, you would put some crazy flavour combination together for your Asian cake! Love the background and the cake sounds like a fabulous treat! Thanks :) Cassava and mung beans go really well together. I just looked up the Filipino version and it looks amazing, love the topping! I loved all the desserts that I found in Vietnam when I was there in 2011 and they were so cheap too! Hi Winston :) I'm well! I definitely bake western style cakes more and have only recently tried to get into baking more Asian sweets from my childhood. Hope you managed to find grated cassava. This looks amazing. I will have to try it out. Thanks for showing what it should look like as I have made Asian foods before, but I am not that knowledgeable! Thanks Jennifer, it took me a few tries to get the right texture and this recipe rises well and is very uniform. Good luck with baking! I've never tasted anything like this but it sounds delicious. Hi Maureen :) Hope you will get a chance to taste this cake, I think you will like it. Maybe you will find some at your Asian supermarket or try baking this, it's pretty simple. I had a piece of a cake very similar in Vietnam and loved it. Food from our childhood certainly invokes such vivid memories, that really scares me knowing what my teenager will eat. I love that your Mama used to haggle for a freebie. A lady after my own heart - I love a bargain! The cake looks lovely. Looks gorgeous! I have been wishing that I could get cassava closer to me for years! It's such a shame that I have to make the long trip into the city everytime I want to cook with cassava! It's such a great tropical ingredient, great idea for the theme! You did a pretty great job on this cake, it looks perfect. 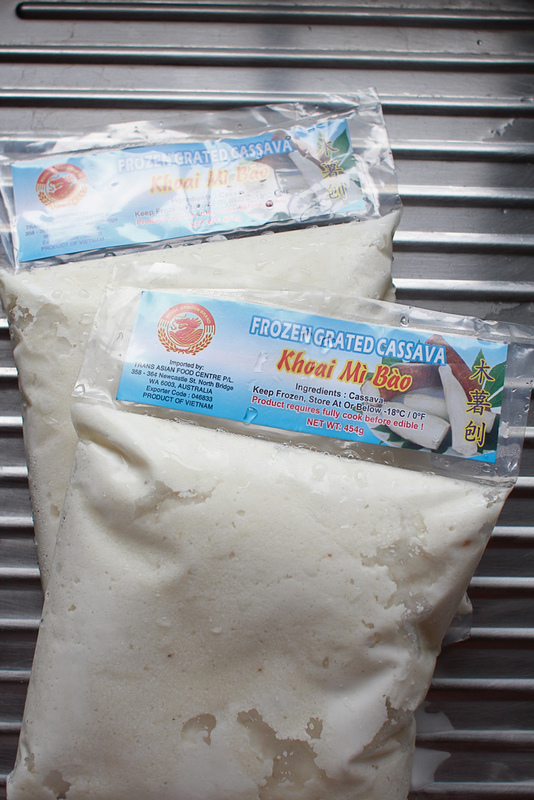 Thanks K-bobo :) I guess the good thing about cassava is that if you get the frozen variety you can stock up and have a supply handy to use. The texture of cassava is interesting, look forward to experimenting with it more in baking. This looks awesome, Ai-Ling. I want a piece of this right now. I'm trying to avoid gluten at the moment so this is perfect for me! Thanks Christina :) There are lots of Asian gluten free treats available, I need to learn how to make more of them! This looks absolutely fantastic. I grew up with and love these sorts of cakes but never properly learned how to make them. I will definitely give this a try, thank you for sharing!! Where did you find your desiccated coconut? I can't seem to find it other than online. Thank you for the inspiration, I changed the recipe a little bit: I used Indonesian Hungkwe (mungbean flour) instead of dry yellow mungbean, didn't add any condensed milk, reduced the amount of sugar, and sprinkled the cake with finely chopped nuts, desiccated coconut and sesame. It tastes very yummy, like the cake we ate in a Vietnamese restaurant.